Compression Couplings offered by us is manufactured using die cast zinc alloy, which proves to be effective for power transmitting device. These are available in self-color and electro galvanized finishing. 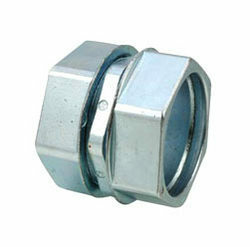 Our range of couplings finds application in various industries owing to its high end features. We manufacture these couplings in customized forms to meet the specific requirement of our clients. Our range of Compression Couplings can be availed at market leading prices.